When J and I lived in Venice, we made a tradition of meeting my dad (Levi Mike) and his girlfriend Christie (collectively known as D&C) in Borrego Springs over President’s Day weekend. They make the trek each January to escape the frigid winter temperatures of Boise for two or three months. A 3-hour drive from Venice, Borrego Springs was an easy place to meet them, and a welcome respite from the workaday stress of Southern California life. Last weekend, J and I resumed the tradition. We drove down from Santa Monica on Friday afternoon, made good time, and commenced with the desert relaxation involving golf, wine, home-cooked dinners and lunch on the town. 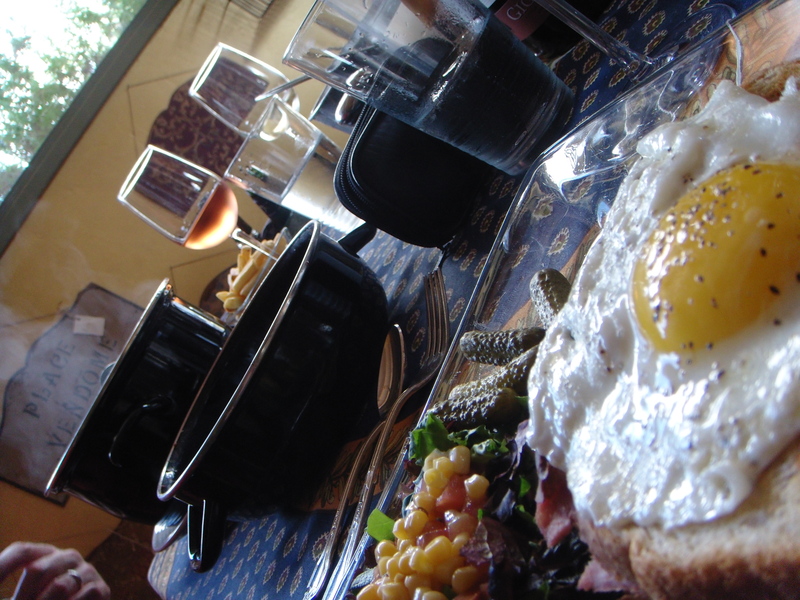 Saturday’s lunch took us to the most unlikely spot: a quaint French bistro called The French Corner. For years, Christie raved about this little spot, and everything was she described: a cozy, well-spaced dining room/gift shop with tables topped with Provence-style linens, walls lined with decorative signs (for sale) and shelves filled with antique enameled French coffee pots. The owners, two Belgian fellows who spend summers in Provence (what a life! ), charm with their dry wit and wry sense of humor. The food? Delicious. D&C had crab quiche, with flaky, buttery crust and generous crab filling. J opted for a steaming bucket of plump Basque mussels with a sop-up-able tomato and olive sauce. (When J commented on the deliciousness of the mussels, owner Yves quipped, “From the Salton Sea!”). I am always tempted by croque monsieur, but I prefer the ham-and-cheese sandwich topped with a sunny-side-up egg. When I asked if I could make mine a croque madame, Yves, with a half smile, ribbed me about the request, but complied. The result was melty, yolk-y perfection. French Corner: What an unexpected surprise in a tiny desert town. Tres bien. Que romantique!